Whether its an emergency call list, a tip chart, or a calendar, Plastic Works can accomodate you and any other idea you might have. 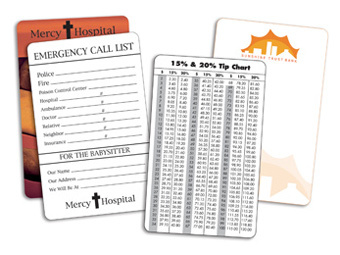 Wallet Cards can be printed in a variety of shapes or sizes, in addition to the standard credit card size. Please contact Plastic Works to discuss the many options offered. Customization options such as Variable Information or Write-On Surface are also available.